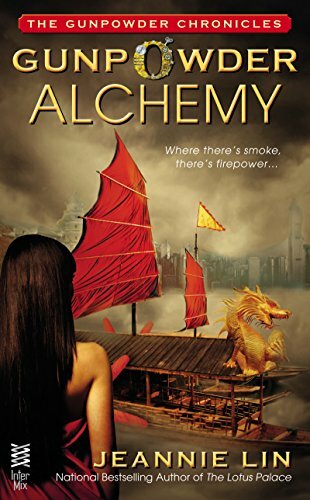 Historical romance novelist Jeannie Lin’s foray into steampunk, “Gunpowder Alchemy,” offers readers a rich cultural and historical feast along with adventure, restrained romance, dragon airships, pirates, rebels, imperial princes, revolutions and old-school conflicts over loyalty, duty and honor. Lin’s tale is intelligent, innovative, culturally authentic, engaging and well told. First, a word about genre. “Gunpowder Alchemy” is steampunk, but not your usual steampunk fare set in England or the U.S. Wild West with feisty Victorian ladies running around in corsets pursuing adventures in dirigibles with their clockwork mechanical friends and their Babbage computers. Instead, our story is set in 1850 China, during the turmoil of the Opium Wars, and our heroine is a fallen Manchurian aristocrat, living hidden in the middle of nowhere after her father, the Chief Engineer to the Son of Heaven, was executed for failing to fight off the overwhelming military forces of the West. Our heroine, to feed her little brother and opium-addicted mother, must venture into the big city to sell the disgraced family’s last possession of any value. Adventure ensues, set against a historically accurate portrayal of the times, a turbulent and violent chapter in China’s history as that sophisticated empire collided with the brash and militarily superior Western powers. Some critics have complained that Lin’s story is not steampunk enough, to which I can only reply that they are missing the point of steampunk. The heart of steampunk–and here I refer to steampunk beyond its manifestation as literature or steampunk as a science fiction genre to the wider cultural steampunk movement of the last few years–revolves around its fascination with technology, whether it be in the steampunk Do-It-Yourself/Maker movement or the re-imagining of a better past seen in more mainstream steampunk stories. The whole story grapples with the moment in history when China had an existential need for the technology to fight off the foreign invaders, and deals with characters who for various motivations and in different ways, struggle with that overwhelming challenge using every skill of engineering and science at their disposal. Lin’s story is MORE than merely steampunk, in that it also offers an engaging and authentic experience of a culture and a time period unfamiliar to many Western readers. So to steampunk, add “historical fiction,” ‘historical fantasy,” “alternate history” and yes, Lin’s forte, “historical romance,“ to the other genres that could also be used to describe elements of this novel. Lin’s characters are a product of her chosen period, geography and their class and station in a rigidly status-conscious culture, not modern yellow-faced white Anglo adventurers marching through historical sets. Lin’s grasp of the history and culture of that period in Chinese history is confident and authentic, and provides much of the pleasure in reading this tale. The romance thread is beautifully and delicately portrayed, with all the constraints of that time pressing down on the growing attraction between the lovers. To our coarser modern tastes, the lovers’ restraint may seem quaint or sweet, but I found it moving and real in its context. The devastation opium wrought on the Chinese people of that time is vividly portrayed in the opium-addicted mother of the heroine, as well as the ravaged and violent victims of a mysterious form of amped-up tainted opium (somewhat reminiscent of Cherie Priest’s zombie army, formed in a different way, so take that, steampunk-genre-doubters!) The cultural meaning, pride and suffering associated with the custom of foot-binding is touched upon as well, with a marvelous steampunk solution woven into an important plot point. The world-building is meticulous, whether in its descriptions of a rural village or the bustling urban centers, both the Chinese and the foreign quarters. Technology is of the time, augmented occasionally with delightful steampunk inventions blended with, for example, traditional Chinese medicine methods. I’m a round-eyed pale waiguoren, but one armed with a degree in East Asian Studies and a smattering of Mandarin, and I truly enjoyed experiencing the history and culture Lin depicted so masterfully. Where she made linguistic or historical simplifications in support of drama and pacing (always the right choice! ), she did so with intelligence while preserving the essential truth of the culture and history. Finally, the writing and craft are smooth and well done. Lin’s writing is clean and spare, not ornate, with just enough detail to keep things concrete without slowing pacing. I have an old-fashioned preference for stories told in the third person point of view, but I found myself adapting quickly to the protagonist’s first person point of view as Lin unobtrusively engaged me in her story. I found myself questioning my own preferences as I enjoyed the immediacy of her first person POV. Recommendation: for historical fiction fans interested in China, for sweet historical romance fans, and yes, for open-minded steampunk adventure fans willing to try something other than same-old Anglophile steampunk. Each of you will find a tale well-crafted, full of unique and interesting characters set in an unfamiliar and vividly real world. I’ve already downloaded the next book in the series, to see where Lin and her characters go next! Previous Previous post: COVER DESIGN AWARD!